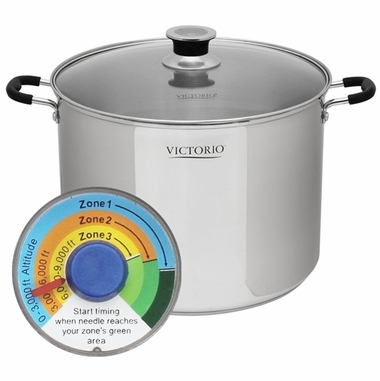 The Victorio Stainless Steel Multi-Use Canner is the ultimate in quality canning stock pots. The clad bottom makes this stainless steel canning pot great for kitchen ranges and induction ranges. It also comes with a tempered glass lid which means you will not have to take the lid off to see what is happening inside your pot. This stainless steel canning pot also comes with a temperature indicator with different elevation zones so you can start timing your canning job correctly. fine service, good quality, fair price! Canned lots of applesauce with my new canner. Hanging rack is really helpful, like the gauge in the lid, and it's beautiful to boot! First time canning and your product was recommended by America Test Kitchen and I trust them. Well, once I got the hang of it now I feel like I am a pro. The canner is of good quality and it took all the guess work out of canning and the gauge in the top was a brilliant idea. Thumbs up. I love my canner, I have had it for two years now and I haven't burned anything in it so far. I bought it in 2015 after my accident. I was carrying one of those black speckled canners completely full of tomato sauce and tripped and fell. I ended up having to dump the sauce because it chipped the inside of the pan. Also I was always burning on the bottom. This pot is the best thing ever and it also has a temperature control on the lid. Love it !!!!! This water bath canner is awesome! Would definitely recommend it. This is an excellent, fool-proof, steam canner. I have used an aluminum canner for over 40 years and processed literally thousands of jars of tomatoes. While I had great success with no errors, I have found the Victorio Multi-Use Canner to be vastly easier to use and much more precise. This would be an excellent product for those that are just getting into steam canning, because there is less chance of error compared to using an aluminum steam canner that needs to be monitored by the length of steam escaping from vents in the lid. Just be sure to follow the instructions provided. We were in the middle of canning when it arrived. It got put to work immediately ! It is far superior to our old ones that we had used for years. On average we put up about 100 jars of beets, applesauce, peaches, and pickles of various kinds. We share with others and now do canning for friends.